Henry Bell & Co (Grantham) Ltd has extended its portfolio of premium animal feed products to include the new EQUIGLO brand delivering first-class equine nutrition at great value-for-money prices. 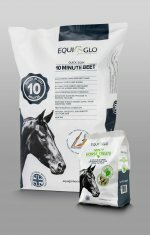 The first product from the EQUIGLO stable is Quick Soak 10 MINUTE BEET, which is perfect for all horses and ponies. A 100 per cent natural British superfood, EQUIGLO Quick Soak 10 MINUTE BEET provides a convenient source of non-heating energy for working horses and ponies all year round – and is perfect for those prone to laminitis. It is an ideal replacement for cereal-based feeds and forage, particularly for veterans with poor dentition or when quality is poor. EQUIGLO Quick Soak 10 MINUTE BEET (18kg): RRP £9.95. For further information, telephone 01476 565761 or email info@equiglohorsefeeds.co.uk. EQUIGLO and 10 MINUTE BEET are registered trademarks of Henry Bell & Co (Grantham) Limited. Henry Bell wins the trade mark infringement case that Supreme Petfoods bought against them. Mr Johnson's is part of Henry Bell & Co a family-owned business that have been producing animal feeds for over 100 years. All those years experience have been put to good use in develipoment of unique and tasty recipes that small animals really enjoy, whilst providing the essential balanced diet for small animals health and vitality. Henry Bell are members of FEMAS. FEMAS covers all feed ingredients intended for direct feeding to animals or for inclusion in compound feeds and blends. It is based on HACCP principles, a system originally pioneered by space agency NASA, but now forming the bedrock of EU Food and Feed legislation.